UCLA Labor Center | Get Healthy, California! 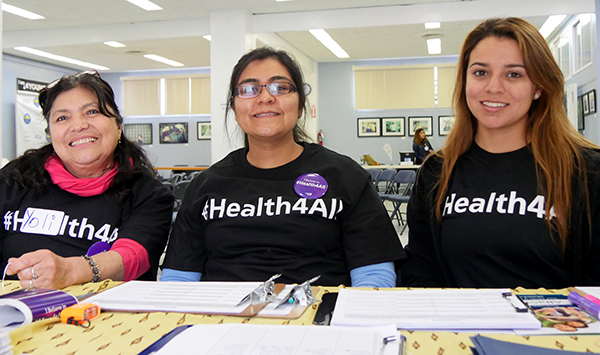 Access to health care is limited for undocumented and uninsured individuals. The Affordable Care Act (ACA) provided many with health access, however, undocumented immigrants and Deferred Action for Childhood Arrivals (DACA) recipients are nationally excluded. An estimated 11 million people in the United States are undocumented. In California, roughly 1.5 million undocumented Californians are without medical care. This exclusion leads people to delay hospital visits or accumulate thousands of dollars in medical debt. Some wait months or years for surgery on county lists, or pass away. With regular medical care and visits to the doctor many painful, expensive and easily treatable medical conditions can be prevented. The wellness and health of undocumented and immigrant families depends access to medical care and support services. Although the Affordable Care Act does not cover undocumented immigrants, in California there are medical facilities that provide health services for undocumented Californians and mixed-status families. The resource guide developed out of a need to identify clinics and hospitals that do not turn away undocumented Californians and provide individuals and service providers with referrals to available, low cost medical services. The guide is an expansion of the original statewide health guide created by Healthy California 2013 fellow Angelica Hernandez. Angelica worked with leaders of Hispanas Organized for Political Equality (HOPE) to compile the statewide guide as a part of her summer fellowship. The Healthy California 2014 cohort updated the healthcare resource guide to provide expanded low cost medical options to uninsured and mixed status families in the state of California. The resource guide provides a list of affordable healthcare options in the state of California. The listings include healthcare provider contact information, hours of operation, the type of services offered and types of fees. The resource guide provides information of medical services in 6 regions in California – Northern California and Bay Area, Central Valley, Los Angeles County, Inland Empire, Orange County and the San Diego Region.